Mini plastic pumpkins are the perfect size to fill with your favorite Halloween candy. This jack-o-lantern design plastic pumpkins are just big enough to fill with a fill with a handful of treats making them the perfect size for your Halloween party or to hand out for trick or treat. Or any other smaller size candies. If you are having a Halloween Party, these mini pumpkin candy cups look so cute filled with candy sitting around the room. You guests can just munch away on the sweet treats. 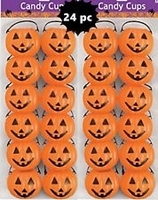 Each mini plastic pumpkin is approximately 2 inches in diameter with a 1 1/2 in handle. You get to packs, each pack has 12 pumpkin for a total of 24.